More neoliberal policy won't help Puerto Rico solve its debt crisis. This year marks a decade of economic contraction in Puerto Rico. The causes of the downturn in an economy once seen as a successful model are varied and complex. Factors such as the popping of a construction bubble, the dismantlement of the industrial model of development, the expiration of a federal tax break for corporate income, the approval of CAFTA-DR, changes in the global economy, incompetent and servile government administrations, and the island’s colonial relationship with the United States have all contributed to an economic depression that predated the worldwide crisis. Not surprisingly, the situation was then aggravated by the financial collapse of 2008, which led, among other things, to reduced credit for small and medium firms, many of which ended up having to close down. Since then GNP has fallen dramatically (2 percent annually on average for the past eight years), unemployment has climbed into double-digits (270,000 jobs have been eliminated), and crime has reached record levels. Already bearing the scars of colonialism, the economic malaise has set Puerto Rico back even further. Per capita income in Puerto Rico is almost half that of Mississippi, the US’s poorest state. The jobless rate is 12.6%; in West Virginia, the state with the highest unemployment rate in the US, that number is 7.4%. Puerto Rico’s labor participation rate is around 43%, 20 points lower than in the US as a whole. Median household income is almost $7,000 less than in Detroit (and less than half of the US average). And a staggering 45% of the population lives in poverty (compared to about 15% in the US). Many have responded to the deteriorating economic conditions by fleeing the island. Unable to exercise this option, the governing parties have taken turns responding with a variety of neoliberal prescriptions. But they have only exacerbated the fiscal and economic crisis. Anchoring its public policy in the private sector of the country and abroad, the new government worked to create a better investment environment with neoliberal structural adjustment policies like the firing of 30,000 public employees, tax reform favorable to the rich, increases in tuition fees for higher public education, the privatization of public assets, deregulation of business permits, and the like. Unsurprisingly, these policies did not have the desired effect. In the first place, it is theoretically and practically known that an economy experiencing a downturn will probably not experience growth if government spending is reduced. Puerto Rico’s own economic history attests to the importance of the public sector and government spending in fostering economic growth. The second reason why these policies did not succeed, and one which coexists in an uneasy tension with the first reason, is related to the fact that Puerto Rico is both peripheral to and dependent upon the economy of the United States. The economic model of “industrialization by invitation” that for decades has characterized industrial policy in Puerto Rico has been sustained by a high number of subsidies and tax exemptions whose purpose is to attract foreign (mainly American) capital. This tax and corporate haven arrangement, with no accountability in the case of private failure, has further accentuated the fragility and dependence of the economy. On the one hand, the criterion of “competitiveness” under intensified global competition has translated into a race to the bottom in which costs are socialized in an attempt to prevent capital flight. On the other, a substantial amount of wealth created in the island is extracted and not reinvested — $35 billion in manufacturing profits, or approximately a third of GNP, are repatriated back to the United States. Together, these factors have placed immense stress on the government’s resources while also contributing to an institutional scaffold that has facilitated a form of structural blackmail within a trickle-down logic. Simply put, the needs of capital have taken absolute priority over those of society. The cuts in public spending, best exemplified by the mass termination of public employees in 2009, have had a negative multiplier effect on the economy because they’ve failed to spur an increase in private sector investment and employment. To cover the shortfall, the New Progressive Party issued around $17 billion in debt over its tenure, or 22 percent of GNP. In other words, more than a fifth of the country’s total debt burden was comprised of bonds and lines of credit opened by the public sector to contain an economic freefall effectively created by the same government. It is also important to point out that, apart from the debt, this government had access to $6 billion dollars (8.6 percent of GNP) courtesy of the Obama administration’s American Recovery and Reinvestment Act, and to liquidity injected into the local banking sector to prevent its decapitalization. 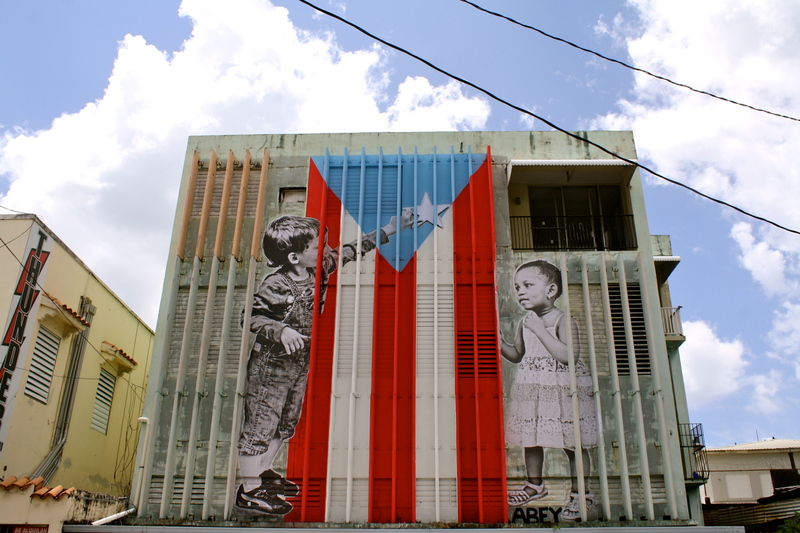 The most conservative estimates calculate that around $25 billion was funneled into the Puerto Rican economy, meaning outright austerity would have had even more dire consequences. In 2013, the New Progressive Party was voted out and replaced by the Popular Democratic Party, a purportedly center-left formation that had promised to stop laying off public employees. The limits of its agenda were soon clear given that things like collective bargaining, wage increases, and consolidation of agencies were not even on the table. Despite its tepid program, the new administration’s arrival prompted immediate credit downgrades from Moody’s, S&P, and Fitch; the shutting off of access to primary debt markets for the Puerto Rican government; and a fall in the value of the country’s bonds in secondary markets. To make matters worse, many of the government bonds contained “acceleration clauses,” which meant that the minute the Puerto Rican government failed to make a payment on time, it owed the debt in full. Since it was shut out of credit markets, it couldn’t refinance the debt by issuing new bonds. When its debt servicing payments doubled, the government responded by slashing public spending. Soon after, it increased the tax on oil and hiked the sales tax, burdens that have contributed to soaring costs of living. In the meantime, debates have sprung up about whether the debt should be restructured or paid back under the original conditions agreed upon with creditors. Proposals from new political parties and law projects emerged out of these debates, providing the government with some ammunition to declare a moratorium on the payment of the debt, to audit it, and to renegotiate it. But of all the proposals, only one became law — the right to declare local bankruptcy. The Debt Enforcement and Recovery Act created a legal and institutional framework enabling Puerto Rico to decree debt renegotiation without the need to appeal to federal forums in the US. But last month, the law was declared unconstitutional due to “preemption” — US federal bankruptcy law explicitly excludes Puerto Rico and its municipalities from the federally protected right to restructure its debt. This strict, literal interpretation of the law leaves Puerto Rico with few options to maneuver around its massive public debt, which is heightened by its middling economic growth. In the current conjuncture, the threat of default is the only viable alternative to convene creditors for a renegotiation of the terms of the debt. The problem with this approach, however, is that outside the protection of the law, it will in all likelihood result in a lawsuit in the federal courts because the country’s constitution clearly states that the payment of public debt has priority over other disbursements. The well-known case of Argentina’s debt restructuring is instructive here. Hedge funds used the impairment-of-contractual-rights argument to require compliance with terms agreed upon prior to Argentina’s default and to not accept the renegotiation terms. In Puerto Rico, a significant part of the debt is also in the hands of hedge funds, who could pursue the same course of action they did in Argentina and try to force more spending cuts and demand tiered increases in debt repayment. After multiple failed attempts at renegotiating and restructuring the debt via legal and institutional mechanisms that require a specialized third party, the Puerto Rican government commissioned a study from advisers associated with the International Monetary Fund (IMF). Published at the end of June, the report proposed a raft of supply-side measures: reducing production costs (mainly labor costs), reforming the tax code with more weight on real-estate property and indirect taxes (direct taxes would be eliminated), and cutting the budget of the Puerto Rican government’s General Fund. Current debates about the study have focused on the fact that the majority of the proposals to reduce production costs — decreasing the minimum wage, weakening labor protection laws, exempting the country from cabotage laws — are at odds with federal laws prohibiting their supersession by an institution like the IMF. Shortly after, mutual and hedge-fund bondholders commissioned a second study, appealing to the “expertise” of economists who have also worked for the IMF. The authors concluded that the debt was payable without concessions to bondholders, in clear contrast to the first report. The report’s analysis was clearly a reaction to the statement of the statement on June 28 by Puerto Rico’s governor that the island’s “debts are not payable,” a statement that has recently materialized with the inability of the government to meet an August 3 deadline for a full $58 million bond payment. This, and other potential future defaults, will probably accelerate the implementation of what both commissioned studies suggested: more doses of austerity (closing of schools, firing of teachers, reduction of the minimum wage, etc.) to pay off the debt. Puerto Rico’s lackluster economy is the result of a variety of short, medium, and long-term factors ranging from the failure of industrial policy to the intrinsic limits of operating within the US legal framework as a territory. All of these dimensions have given form to an economic model based on the extraction of wealth, where salaries do not match productivity, a substantial amount of the wealth produced and profits derived in the island is repatriated and not reinvested in the country, and where debt is used to loot the wealth that does remain on the island. Under these conditions it is not surprising that the economy has followed a downward spiral — with dire social consequences. The various political parties that have accessed power through the years have demonstrated continuity by proposing and applying neoliberal policies that have amplified the fiscal crisis and undermined the potential for economic recovery. The attack on the public sector is the most noticeable of these approaches. Unsurprisingly, economists and analysts from all over the world are now paying attention to what could be the largest municipal bond default in US history. Paul Krugman recently wrote that thanks to the safety net provided by the federal system and “big government,” Puerto Rico’s case “is one of bad times that fall well short of utter disaster.” Like a good philanthropist, our Nobel laureate seems to want Puerto Ricans to be thankful for what they have received, given that they have not ended up like Greece. This myopic take, however well-intentioned, abstracts from the historical processes of political and economic control and wealth extraction by the United States over its colony of 117 years, processes that to this day shape the downward spiral in which a decomposing Puerto Rican society finds itself. This deterioration in the social fabric will only get worse with the probable new rounds of austerity, imposed by a government that responds to a capitalist class eager to see an immediate yield on their investments. One might have expected a mass upsurge over the last decade challenging these austerity policies, particularly as the crisis grew more acute. But the escape valves available to Puerto Ricans (emigration, federal transfers, informal economy) in combination with the violence of the state have mitigated the type of mass protest that other countries, like Greece, Argentina, and Spain have experienced in recent years. Still, more voices against austerity have emerged, voices that, among other things, want social spending to be prioritized over debt repayment. New organizations and political parties have also emerged and are working hard to fill the ideological and ethical vacuum while seeking to transform the political landscape. Perhaps the most fundamental question is whether social justice can be achieved without disrupting the current structure of power, both in Puerto Rico and vis-à-vis the United States. We believe it cannot be. More neoliberal policy won’t help Puerto Rico solve its debt crisis.